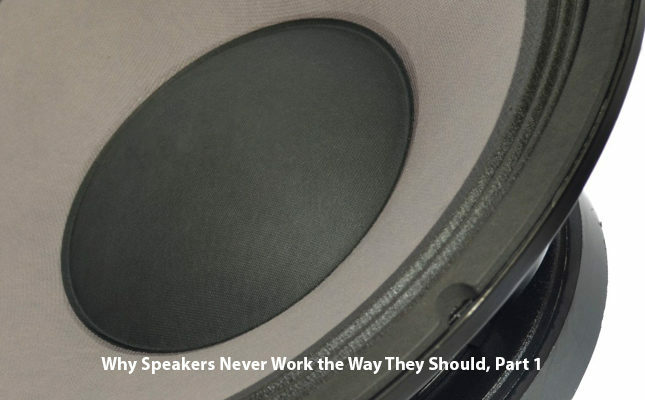 One of the very hardest parts of trying to get speakers to sound like real music is that there’s a flaw in the basic physics of loudspeaker design that applies – particularly in the lower frequencies – to virtually every kind of loudspeaker mechanism. Whether it’s a cone or a panel, multiple drivers of practically any kind, or anything else at all other than Bruce Thigpen‘s helicopter (variable pitch fan) design or one of the plasma drivers, the way a speaker works is by having a diaphragm move back and forth, compressing the air before it and rarifying it behind, to produce sound. That simple fact makes for a basic problem that, to my knowledge, has never yet been solved, and may never be. The difficulty with any interrupted motion design (again, anything at all other than Thigpen‘s constant-motion fan or a no-diaphragm plasma design) is that the diaphragm – the cone, panel or whatever it is that moves back and forth – must move forward, stop, move backward, stop, move forward again, stop again, and so on, accelerating, moving, and stopping, two times for each single sinusoidal waveform it reproduces. The frequency of a tone is the number of times an identical component waveform is repeated in each full second of time, so a 20 Hertz tone, for example, consists of 20 identical waveforms, each 1/20th of a second in duration, repeated as many times as the tone is long. (With two start/move/stop sequences per waveform, a 20 Hertz tone exactly one second long would therefore consist of exactly 40 such sequences.) And, if it’s a complex waveform, like music, that has multiple frequencies playing all at once, the number of such sequences could be very much greater, to whatever limit the music calls for. 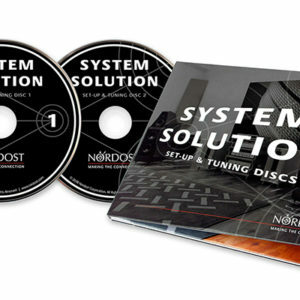 For good sound reproduction, the most important parts of those sequences are start and stop, because those are the ones involving changing velocity; while, for as long as it lasts (which could easily be never – especially if more than a single frequency is involved), the move portion is simply, after full speed has been reached, coasting at constant velocity. Getting the diaphragm up to speed – the acceleration part, either forward or back – is impossible to do with absolute accuracy because of the effects of inertia on any physical body: a physical diaphragm, because it has mass*, will always require more than zero time to catch up with the motion required of it by the driving signal, so there will always be some undershoot in diaphragm starting motion. 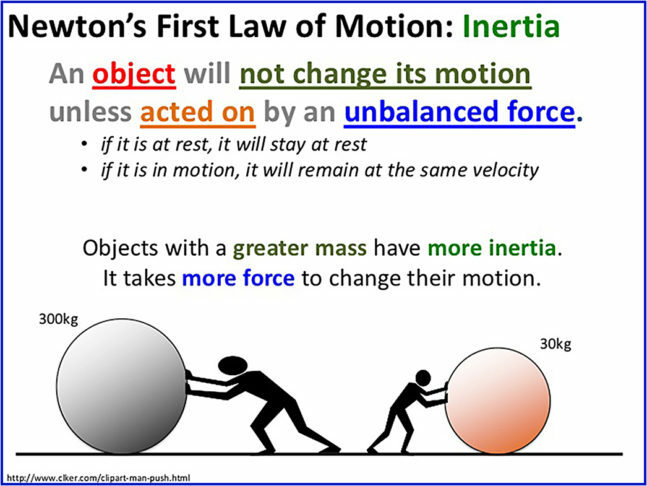 And then, after the driving signal has stopped and reversed phase to get the diaphragm started in the opposite direction, inertia will, once again, come into play to create overshoot – continued motion due to inertia after the driving force has stopped and reversed polarity. * There have been speakers that have claimed a massless diaphragm, notably the Ionovac, the Plasmatronics, the Magnat, and the full-range Toltecque from France. In fact, because the diaphragm in most of these is an expanding or contracting volume of air and air has mass, that claim has not been entirely accurate. None of these speakers has been commercially successful, and many have, by producing ozone, constituted a health hazard to persons in the same room upon prolonged exposure. 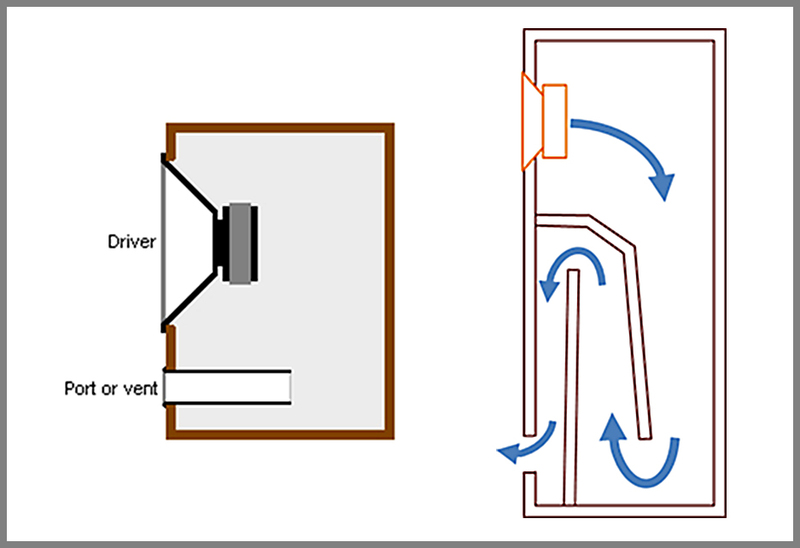 While inertia-related undershoot or overshoot, can never be completely eliminated from any driver that uses a physical diaphragm, getting quicker acceleration or deceleration is comparatively easy: just make your diaphragm as light as possible and make your motor (the magnet-and-voice coil or other arrangement powered by the signal) as big as possible relative to it. The more powerful the motor is relative to the mass of the diaphragm, the closer the diaphragm can come to moving as quickly as it needs to in order to accurately follow the driving signal. It will never be completely accurate, though, because no material object can ever have zero mass, and that’s what would be necessary to overcome inertia and accelerate or decelerate in zero time, exactly in accordance with the driving signal. And as long as the movement of the diaphragm is different from the “movement” (the rate and amplitude of change) of the signal, there will always be distortion and, in the case of speakers, less than perfect reproduction of sound. Newton’s First Law of Motion (also known as the Law of Inertia) says that An object in motion tends to stay in motion unless an external force acts upon it [and] … if the object is at rest, it will remain at rest unless an unbalanced force acts upon it. The external force necessary to bring a moving object to rest instantly – to stop it NOW, which is what we ideally wish to do with a moving loudspeaker diaphragm – can be calculated as F = ½ MV2, where F is the required force, M is the mass of the object, and V2 is the square of the velocity at which the object is moving. This is also the formula for kinetic energy – the energy of motion – which, in order to instantly stop an object possessing it, must be instantly countered with a force equal to and opposite that object’s total kinetic energy. 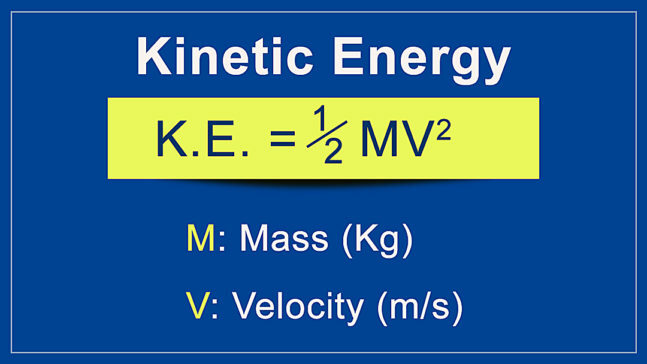 The important things about kinetic energy and the force required to counter it are that both have the same two determinants: mass and velocity; that mass (except at significant fractions of the speed of light) remains constant for any object – in this case, a speaker diaphragm – even at increasing or decreasing velocity, and that the effect of velocity in the formula is exponential; not doubling, but quadrupling or quartering each time the velocity is doubled or halved. There’s nothing inherently either good or bad about this; it’s simply physics. Where it makes a difference, though, is that changes in speaker output level – either increases or decreases (louder or quieter) can, assuming always the same driver(s), ONLY come about through changes in diaphragm velocity. The same frequency can only be produced by the same number of excursions of the diaphragm per second, and any change at all in the number of excursions per second will produce a different frequency. That means that, to just make the sound from a speaker louder or softer without changing its frequency, the ONLY thing that can be done is to keep the number of excursions per second the same, but change the distance traveled by the diaphragm for each excursion. In short, change the velocity of travel. And there, finally, is the problem: the amount of force necessary to control the diaphragm’s motion varies exponentially, while the force available to control it varies only in direct arithmetic proportion to the total movement. Because they are by far the most common of all loudspeaker driver types, especially for low frequency operation, all future references to drivers in this paper will, unless specifically noted otherwise, be to cone-type drivers. For these, there are only four things available to counter or control diaphragm movement: 1) The surround – the pleated or half-dome-shaped flexible ring (usually of treated corrugated paper, rubber, or a flexible plastic foam) around the outside circumference of the cone that keeps it centered while still allowing it to move back and forth unhindered within the limits of its design parameters; 2) the spider, the corrugated pleated member, often of treated paper or phenolic resin-treated cloth, that does the same thing at the small end of the cone; 3) the signal from the amplifier, both as to music and to damping factor in response to back EMF from the driver(s); and 4) the air impinging on the diaphragm, either or both as the mass of the free air to be moved by the diaphragm in responding to the driving signal or as the pressure effects in a closed box (infinite baffle); a very small closed box (an acoustic suspension system); or the resonant or loading pressures of a ported box, transmission line or horn enclosure. All of these things (with the possible exception of the damping portion of the amplifier signal) are linear in function, with the effect of the surround, and of the spider being strictly in accordance with Hooke’s law, which says of any conventional spring that the force (F) needed to extend or compress it by some distance X will scale linearly with respect to that distance. (Meaning, for example, that compressing it to half or stretching it to double will halve or double the spring force accordingly). Because the amount of change in spring force will always be the same, proportionally, as the change in compression or extension (or bend, for leaf springs, or whatever) these are known as constant rate springs. There are other kinds of spring that are progressive in rate, meaning, as with a progressively wound coil spring, that different amounts of extension or compression will result in increasing or decreasing amounts of resistive force per unit of change. The trapped air in a sealed box such as an infinite baffle or acoustic suspension speaker enclosure can also act as a progressive (variable rate) spring – with the rate of resistance to change in a captive volume of air becoming greater or lesser as the volume is progressively increased or reduced by the movement of the diaphragm(s) of the contained driver(s). It is also possible to design speaker surrounds and spiders of variable (non-linear) spring rate, but I know of none in current use **. 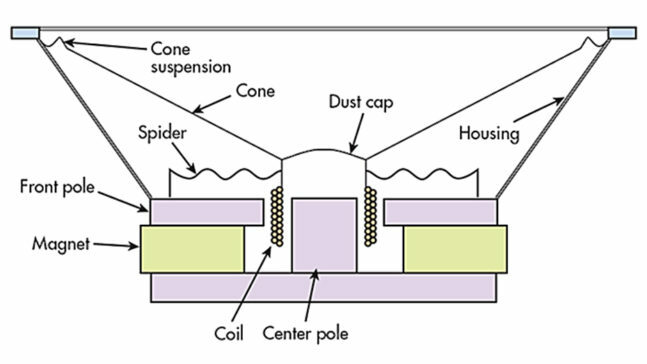 One reason for this might be that neither the changing pressures in a trapped volume of air, nor any progressive rate possible to build into a surround or spider may be sufficient, either singly or together, to provide the exponentially-changing force to precisely control a loudspeaker diaphragm operating over a broad range of volume (loudness) levels. ** Although I know of no commercial drivers that use progressive spider designs, such things are available from suppliers such as this. https://fixmyspeaker.com/product-category/spiders/. Progressive-action surrounds may also be available, either in commercial use or as OEM or replacement parts, but a search disclosed no reference to any or to any suppliers of them. For all reasonable intents and purposes, the factors available to control a driver’s diaphragm movement seem all to be single rate, meaning that they will always respond to changes in diaphragm movement linearly, with a doubling or halving of movement (velocity) being responded to with a doubling or halving of the available control force. The linearity of the spring elements of a loudspeaker system, including the actual springiness of those of the driver(s) and the spring-equivalent and/or resonant functions of the air in the speaker enclosure, horn, or transmission line, directly affects the sonic performance capability of every speaker involving start-stop motion. We’ll see the consequences of this and one potential solution to it in the next part of this article.